Get competitive financing and even find a great deal before you buy. Afterwards, choose from our coverage options to keep you on the road, problem free. Beyond financing, we also offer a wide range of coverage options and auto buying discounts and helpful tools to our members. See Coverage Options and Auto Buying Help below for more information. When it comes to securing your purchase, it’s nice to have additional peace of mind. Learn about the convenient auto coverage options our partners at TruStage® Insurance can provide. Mechanical Breakdown Coverage provides protection against mechanical breakdowns above and beyond the original manufacturer’s warranty. Learn more about what’s available to you as a Garden Savings member. You will need to verify you have auto insurance coverage. You can provide your auto insurance information online or by calling 800-998-0763. Our relationship with Enterprise Car Sales gives our members access to thousands of certified pre-owned vehicles from Enterprise at fantastic haggle-free prices. Look for our promotions with Enterprise throughout the year or visit enterprisecarsales.com. Be sure to check out our Every Day Advantage Program on Enterprise vehicles! Visit Enterprise Car Sales now. Learn more about our Every Day Advantage Program. 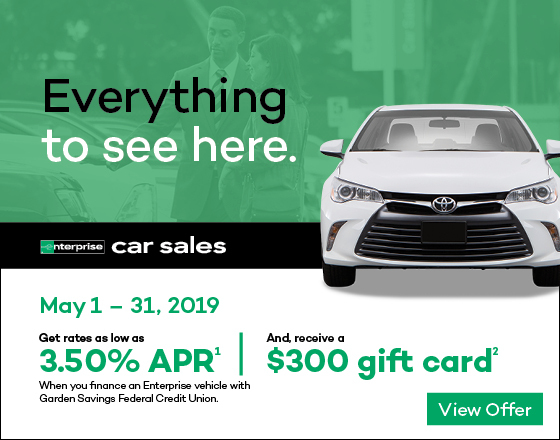 We've teamed up with dealers throughout Northern New Jersey to offer quality vehicles with guaranteed financing. For the full list of participating dealers click here.